Graduates will find excellent employment opportunities for agriscience teachers in high schools and middle schools. 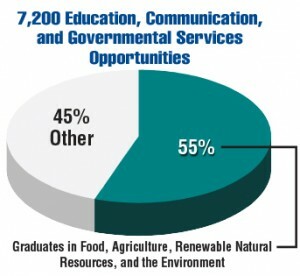 Graduates in agricultural education have skills that qualify them for a wide range of occupations. Because about one-third of the graduates chose occupations other than teaching, schools face an ongoing shortage of qualified high school and middle school teachers. Growing demand for outdoor recreation will contribute to good opportunities for naturalists and forest recreation workers. Consumer demand for safe food means a continued need for governmental inspectors of food processing operations and of imported food and agricultural products. A 2014 report from the U.S. Government Accountability Office notes that nearly a third of the more than 2 million people in the U.S. federal civilian workforce will be eligible to retire in 2017. The high retirement rate among governmental workers will create opportunities for graduates over the next five years. The USDA will be one of many agencies encouraging graduates to pursue careers with them. Growing enrollments in community colleges and universities could contribute to more opportunities for post-secondary and higher education teachers in agricultural, forestry and conservation, and environmental disciplines. However, in some states economic conditions and support of higher education may lead to more adjunct and part-time faculty in lieu of full-time positions. Colleges of agricultural and life sciences will face increasing challenges as they search for faculty members with interests and aptitudes to teach undergraduate courses in applied business and technology. Such faculty members will be in demand to meet the evolving needs of agribusiness, industry, and government. Urban foresters will likely see more opportunities in cities and municipalities. Negative effects of invasive species may contribute to hiring opportunities in some regions of the United States. Increasing regulations in food production, food safety, water management, and environmental quality will increase jobs for specialists in these areas. Even though jobs for communication specialists with social media expertise are increasing, there will likely be more than enough qualified graduates. Multimedia skills will be particularly important for jobs in reporting and broadcast news. A growing agritourism industry will employ graduates. Agricultural communication majors will find more opportunities in marketing, event planning, and public relations occupations. Copyright © 2015-2020 Purdue University. An equal access, equal opportunity university.